ABSTRACT: The Paleogene neritic sedimentary succession in Jaisalmer Basin is correlated with the stratigraphic record in the Indus basin, Pakistan. In a number of exploratory oilwells drilledwestward (basinward) in Jaisalmer the shelf stratigraphic record is more complete than in outcropping sections to the east. In the Tanot-1 well (Oil India Limited) Paleocene sandstone, marl, clay, glauconitic limestone and shale unconformably overlie upper Cretaceous strata. Zone P4 is recognized in about 36m of arenaceous and calcareous clays andmarl, which transgresses the lithostratigraphic boundary between the Ranikot Formation and the succeeding Laki Formation. Planktonic foraminifers in Zone P4 and lower Zone P5 are found only in the –80 ASTM fraction of the residue. Rich planktonic foraminiferal assemblages are found in themaroon coloured shale, clay, limestone andmarl beds 42m above the base of Zone P5 and this level is characterized by the common occurrence of Morozovella rajasthanensis n. sp., Globanomalina luxorensis morphotypes with their typical slightly asymmetric aperture along with Acarinina africana, A. sibaiyaensis and Morozovella allisonensis morphotypes. Morozovellids with weak ornamentation and slightly biconvex axially compressed tests are also present at this level that ismarked by the abundance of acarininids. This biotic evidence of the presence of planktonic foraminiferal taxa typically related to the global Paleocene/Eocene boundary warming event (PETM) is recorded about 39m above the base of Zone P5, which is 102m thick in the Tanot-1 well. The presence of Subzone P5b is indicated by the occurrence of excursion-taxa namely Acarinina sibaiyaensis, A. africana and Morozovella allisonensis. In the inner-middle shelf M. rajasthanensis n. sp., amorphological variant of M. acuta with larger number of chambers in the last whorl, weak muricocarina and umbilical-shoulder ornamentation commonly present above the barren clay beds (1005m) appeared during the PETM and characterizes the Subzone P5b (Berggren and Ouda 2003). 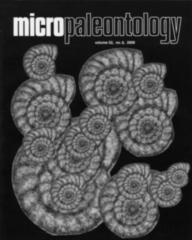 The Paleocene-Eocene planktonic foraminiferal biostratigraphy as proposed by Berggren and Ouda, (2003) is applicable to the Indus Basin.